The global market for pharmaceutical hot melt extrusion has gained a significant momentum, thanks to the versatile usage of the extrudate. The upswing in the popularity of hot melt extrusion, on account of the increasing awareness among consumers regarding the benefits it offers compared to the conventional processing techniques, such as reduced time to market and optimized product efficiency, is also supporting the growth of this market substantially. On the other hand, the rising concerns over the quality and the non-compliance of regulatory requirements have been restraining the market’s progression. Apart from this, the inadequacy of the formulation due to the properties of API and incompetence in delivering on-time supplies may also restrict this market from growing steadily in the near future. 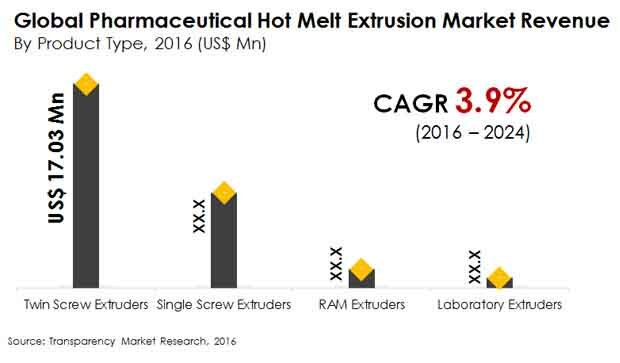 The opportunity in the global market for pharmaceutical hot melt extrusion is likely to increase from a value of US$26.6 mn in 2015 to US$36.4 mn by 2024, swelling at a CAGR of 3.90% during the period from 2016 to 2024. In terms of volume, the market is expected to expand at a CAGR of more than 4.7% over the same period of time. On the regional front, the worldwide market for pharmaceutical hot melt extrusion has been categorized into North America, Asia Pacific, Latin America, Europe, and the Middle East and Africa. With a share of nearly 38%, North America led the global market in 2015. Thanks to the presence of a number of established players, this regional market is likely to continue to dominate over the next few years. Europe has also been witnessing steady growth in its market for pharmaceutical hot melt extrusion and is expected to remain so due to the high demand for improved medical equipment and the increasing adoption of extruders. However, it is Asia Pacific, which will exhibit the most prominent growth rate over the forthcoming years. The increasing research and development initiatives and the improving situation of the healthcare facilities in emerging economies, such as China, India, and Japan, Asia Pacific is likely to boost the Asia Pacific market for pharmaceutical hot melt extrusion in the near future. The increasing standard of medical and healthcare infrastructure and the rising number of government initiatives is also projected to reflect positively on this regional market in the years to come. Based on the type of products, the global pharmaceutical hot melt extrusion market is classified into single screw extruder, twin screw extruder, laboratory extruder, and RAM extruder. Among these, the twin screw extruders segment is the key contributor to this market currently and is anticipated to remain enjoying most prominent demand over the coming years. Laboratory extruders, among other products, are likely to demonstrate a greater rate of demand in the near future. At the forefront of the global pharmaceutical hot melt extrusion market are Baker Perkins Ltd., Coperion GmbH, Gabler GmbH & Co. KG, Leistritz AG, Milacron Holdings Corp., Thermo Fisher Scientific Inc., and Xtrutech Ltd. This report provides forecast and analysis of the pharmaceutical hot melt extrusion market on the global and regional levels. It provides historical data of 2015 along with forecast from 2016 to 2024 in terms of revenue (US$ Mn) and volume (units). The report also includes macroeconomic indicators along with an outlook on hot melt extrusion equipment consumption globally. It includes drivers and restraints of the market and their impact on each region during the forecast period. The report includes revenue generated from sales of hot melt extruders in all regions and important countries in these regions. By product, the global market has been segmented into twin screw extruder, single screw extruder, laboratory extruders and RAM extruders. On the basis of end users, the global market is segmented into research laboratories, contract manufacturing organizations and pharma companies. On the basis of region, the market is segmented into North America, Europe, Asia Pacific, Latin America and Middle East and Africa.